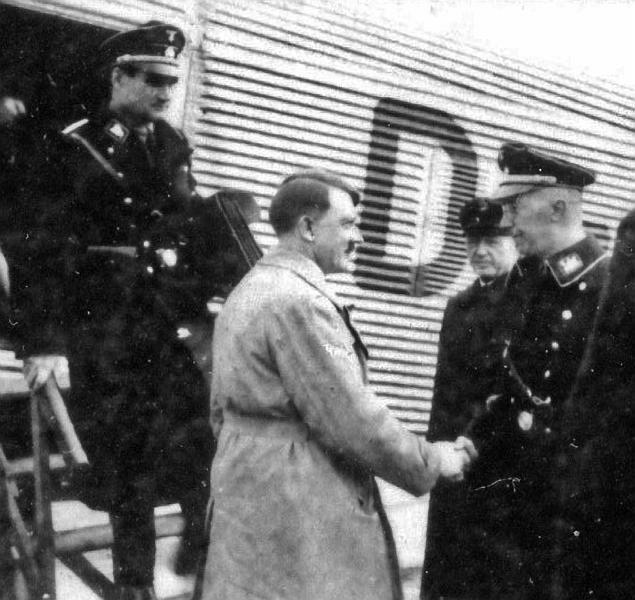 The following is an excellent article exposing the true origins, funding, and aims of the National Socialist party and Adolf Hitler. 1) The Nazi party was socialist by nature and policy, and remember that socialism/communism and any other forms of Marxism are and have been jewish-created and lead movements from the very beginning. 2) As has been documented by various historians (such as “Wall Street and the Rise of Hitler” by Anthony Sutton), the Nazi party was funded and aided into gaining power in Germany by very powerful banking institutions and corporations owned and controlled by the ruling international jewish banking cabal. 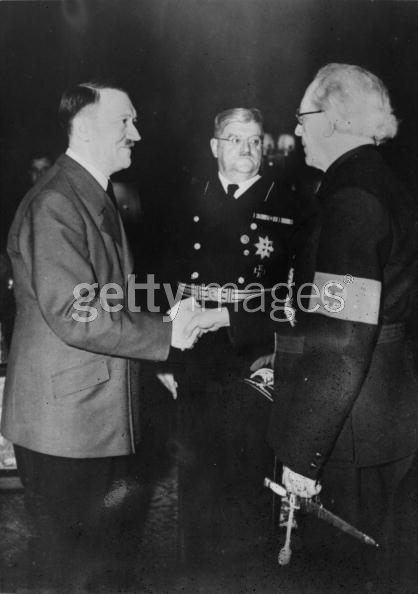 3) While at times masquerading as pro-Christian, the Nazi party was fundamentally anti-Christian by nature and policy. 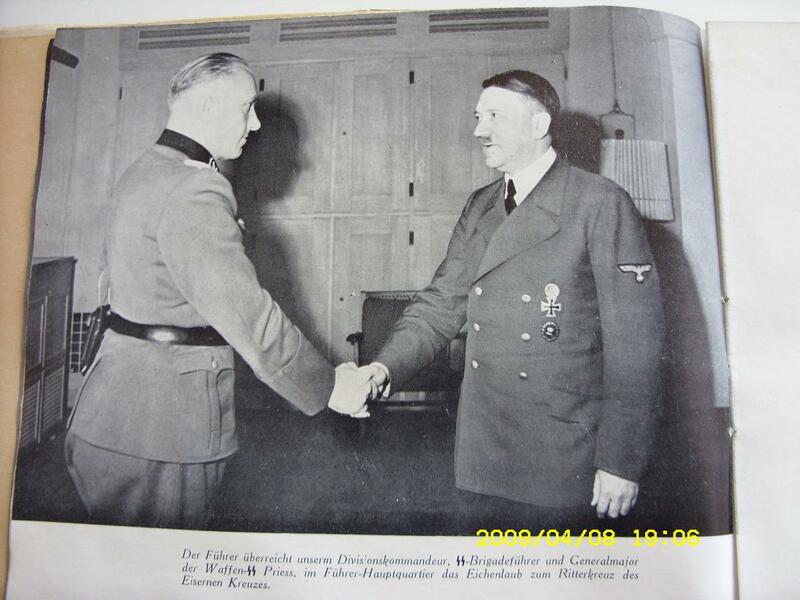 Furthermore, the top leadership of the Nazi party are well-kown and well-documented to have been heavily involved in occult (Satanic) ideology, practices, and rituals. Also, as a disclaimer, I must state that my only disagreement with the article is the view by the author that Paul is a true apostle. As I have covered on another blog, Saul of Tarsus is a false prophet. by BRIG. GEN. JACK MOHR, C.P.D.L. “The kings of the earth set themselves, and the rulers take counsel together, against the Lord, and His Anointed,” (Psalm 2:2). In recent years a disturbing and dangerous element has crept into the Christian Patriotic Movement in America. It is seeking to revive the discredited policies of NATIONAL SOCIALISM, which proved fatal to Germany during World War II and which led that once great country close to the precipice of complete destruction. It is better known as the Nazi Movement, or as the Jewish controlled media like to say the “neo-Nazi” movement. Posing as Constitutional Patriots, many times labeling themselves as Christian, they are misleading an already “brainwashed” population and are harming the Christian Patriotic Movement which is seeking to bring this nation back to God and Constitutional Government. Their loud mouthed rhetoric, replete with anti-Christ gutter phraseology, has turned many decent Americans away from the movement to save their freedom. The reason I feel a compelling need to do this is because numbers of decent Christian Patriots are being misled by these “pseudo-patriots”, who are more anxious for the success of their anti-God movement, than the freedom of the American people. It is as important for our people to know the truth about the ”errors” of the “far-right”, as it is for them to know about the “sins of the left.” Both can be fatal to the cause of freedom, because both attack the very roots of our freedom, which is belief in Almighty God, and His Son, our Savior, Jesus Christ, who alone is able to set men truly free. From the roots of Nazism in America, has risen the ancient pagan religion of Odin worship, and the even more blasphemous rantings of the Church of Creativity, run by one Ben Klassen. Klassen has written a book for his followers titled THE WHITE MAN’S BIBLE. He is a super-intelligent (?) critic of the Bible, who dares to call God a “super-spook” and who laughs at the saving grace of our Lord Jesus the Christ. History has adequately proven that those nations who refuse to abide by God’s Natural Laws, will be destroyed. The sands of history are covered with the bleaching bones of past civilizations who have tried to live on a false religion. In this relatively new (less than fifty years old) religion of Nazism, we see the deification of a man whom many of us grew to detest, not only for his part in World War II, but because of the untold harm he did to the German people, to which 27% of our American people belong. A close study of the Bible, in both the Old and New Testament, will reveal that it is the history of the Adamic people, quite apart from any other race. The descendants of Adam were the original Aryans. When Jesus Christ came to this earth in the body of a man, He came with a specific purpose: ”to save His people (Israel, not the Jews) from their sins.” He was not sent to all the world, as most of our preachers love to tell, but in His own words He said ”I am not sent but to the lost sheep of the house of Israel,” (Matthew 15:24). These were Aryan people, of whom the Germanic people are an integral part. But it is impossible to enter into the Kingdom of God following a false leader, especially one who is elevated to a position equal or above that of God. 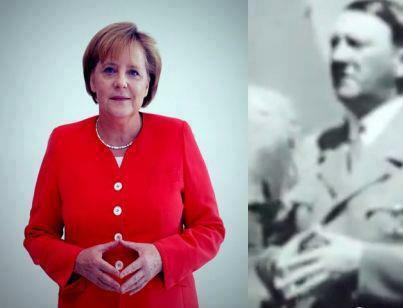 This is idolatry and blasphemy, and this is what the Nazis seek to do with a man named Adolph Hitler. This system, call it what you will – Communism, Socialism, Nazism, is nothing but TALMUDIC JUDAISM in disguise. The writer then goes on to speak of a Hitlerian Religious Order which will take over the world when the Brittanic-Jewish civilization is finally destroyed. Now I readily admit that Britain, the United States and all of Christendom, has been taken over by World Zionism. They control all these so-called Christian countries. From my study of Scripture, I believe this World System will be destroyed when Jesus Christ returns to rule as King of Kings, and Lord of Lords! But it will not be destroyed by a leader with “feet of clay,” who led the German people to the brink of disaster in World War II. There is no doubt that I will come under vicious attack from the neo-Nazi element in this country who have made Hitler their God and who are ever using his symbols in their worship and even in their greetings. So be it! I have found them to be among the most vicious enemies, exceeded only by the Jews in their hatred of our God. Their hatred and venom will not stop me from telling the truth! My loyalty is to my God, and to my Savior, not to some dead man. I do not seek to persuade you, but as a watchman on the walls of America, I am compelled to warn you when danger approaches and Nazism is a grave danger. What you do with this warning is strictly between you and God! Strangely enough, this heresy is in complete conformity with that of a German Jew named Ludwig Feurbach, who lived over a hundred years ago and wrote: “Man will be finally truly free, when he realizes there is no god of man, but man himself.” This idea became so deeply ingrained in the diseased mind of a radical Jew named Karl Marx, that it became the bedrock upon which modern Communism was raised. Hitler once declared: ”First I believe in Almighty God and I solemnly declare that God has chosen me for this task.” This book then goes on to say: ”Hitler’s one enemy was International Jewish Finance.” I will prove to you, before this article is finished, that it was the power and money of International Jewry, that put Hitler into power and caused him to lead Germany towards her destruction. In other places in this blasphemous book if “Hitler stands on the Rock of the Redeeming Blood of his race.” (There is ample evidence that his background blood was Jewish.) NOW DON’T GET MAD AND QUIT READING IF YOU DON’T AGREE. I HAVE SOME PROOF FOR THIS STATEMENT WHICH I WILL GIVE YOU SHORTLY. 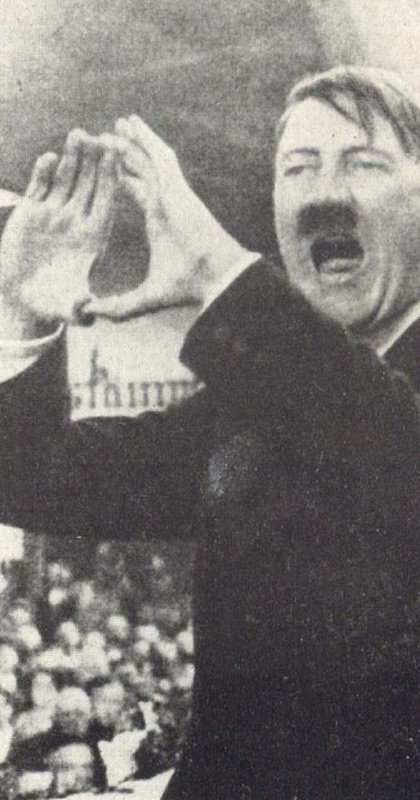 Again: “Adolph Hitler was the light to lighten the Gentiles promised in the New Testament by Jesus. “THAT LIGHT WAS JESUS CHRIST, NOT ADOLPH HITLER! The chapter closes with this pean of praise to a man who turned his back on everything in which the German people believed: “Might is right when it is God’s Might and Dominion. This nauseates me, since to the sincere Christian there can be only one Lord of Lords and King of Kings, and that is God’s Son, our Savior Jesus Christ! But let’s spend a little time looking into the historical background of this strange man whom many worship. The information I am about to give, comes for the most part from a book written in 1954, by one of the greatest anti-Communist fighters of this Century, Kenneth Goff. It was titled: HITLER! and the 20TH CENTURY HOAX! A PLAN TO DESTROY GERMANYNeitzsche, the German-Jewish higher critic said over a hundred years ago: “If Christianity is to be destroyed in Europe, Germany must first be removed from the picture.” (ANTI-CHRIST, by F. W. Nietzsche, p.179, 180). THE AMERICAN HEBREW, leading Jewish newspaper in the United States, in its September 10, 1919 issue stated: “The Bolshevik Revolution in Russia was the work of Jewish brains, of Jewish dissatisfactions, of Jewish planning, whose goal was to create a new world order. What happened in Russia, shall also, through the same Jewish mental and physical forces, become a reality over all the world.” That kind of a statement is mighty hard to refute. Yet it is consonant with the statement made by Hitler that he was preparing for a New World Order. The plans to crush Christian Germany began in Brussels, Belgium in 1909, when at a meeting of wealthy Jewish Bankers and men such as Mussolini, Lenin and Blum, plans were laid for the destruction of Germany. Lenin once said: “It is necessary to use any ruse, cunning, unlawful methods, evasion and concealment of the truth,” to bring about the desired end. This is the proper application of the TALMUDIC principle “the end justifies the means!” It is TALMUDISM pure and simple! 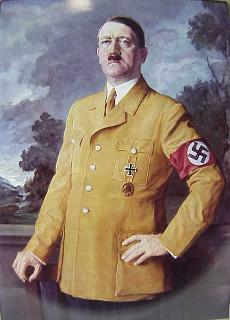 When Hitler named his political party, he called it THE NATIONAL SOCIALIST GERMAN WORKER’S PARTY. This name in itself should show you Hitler’s close tie-in with the teachings of Karl Marx. Both Socialism, Communism and Nazism have their roots in the Bible of revolutionary movements, Marx’s DUS KAPITAL. While Hitler attacks Communism in his MEIN KAMPF, he adopted for his party a Marxist name. 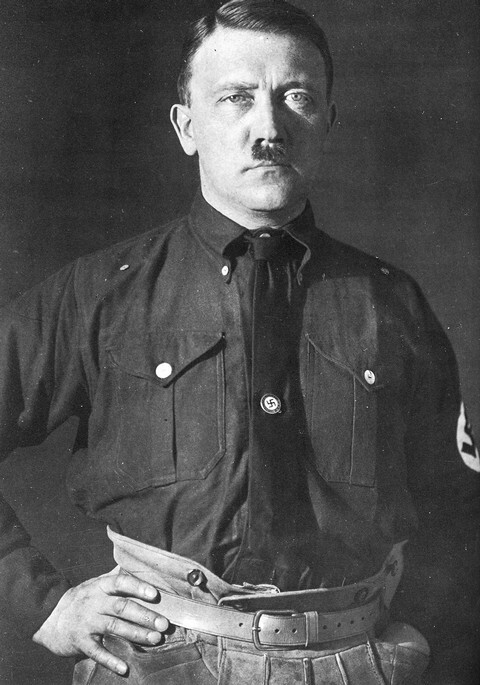 While Hitler in MEIN KAMPF depicted himself as being violently anti-Jewish and anti-Communist, several of his close friends and members of his personal staff were Jews and there are many historians who believe he had Jewish blood flowing in his veins. The story that lie slaughtered 6-million Jews, which has inundated this country in recent years, has proved to be a fabrication of International Judaism, not only to gain the world’s sympathy, but to shovel billions of dollars into the Israeli economy. During the Nuremberg Trials, after the end of World War II, the Nazi leadership was charged with the murder of 3-million people of all races, most of whom were Slavic and German political prisoners. The International Red Cross puts the number of Jews who died in German concentration camps at less than half a million and many of these died from the results of disease and allied bombing raids. 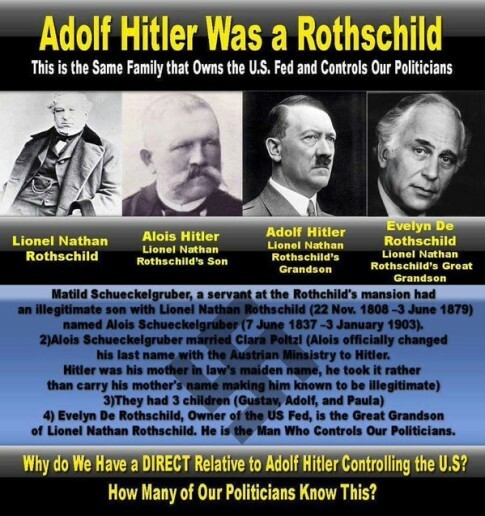 Jews died in Germany, that is true, but what most Americans do riot know, is that it was the International Jewish Bankers who paved Hitler’s way into power. The Internationalists plan to destroy Christian Germany went into high gear when Hitler came into power in 1933. JEWS, THE POWER BEHIND THE THRONE! In 1933, the well known and reputable Dutch publishing company of Van Holkeman and Warendorf, published a book which contained three conversations between Hitler and the International Jewish financier, Sidney Warburg. This book was written in the form of a diary and covered interviews given by Hitler in 1929, 1931 and 1933. 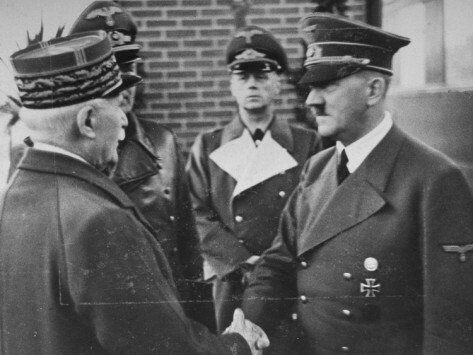 It clearly revealed Hitler’s plan for Jewish finances in rising to power in Germany. On page 15 of this book, we read of a decision made by the United States Government, under the direction of the Jewish Presidential Advisor to President Woodrow Wilson, Edward Mandel House, in which pressure was brought to bear on England and France, to leave Germany alone, so she could become solvent and protect the investments of the International Bankers. On page 18, we learn that in a secret meeting of important International Jewish Bankers, a plan was made to pressure France by inspiring in her the fear of a Communist revolution in Germany. It was agreed that a Nationalist Revolution would be the best for the bankers interests, rather than a Communist takeover. Sidney Warburg, of the New York firm of Kuhn, Loeb and Co., was chosen to go to Germany as a representative of the Internationalists and take charge of the negotiations. 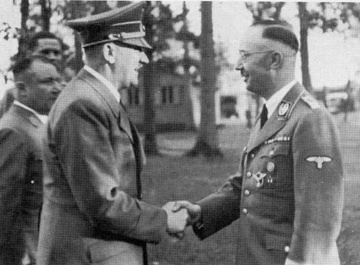 lie held several series of meetings with Nazi representatives in Munich, where it was agreed that an initial sum of $10-mi lovn would be paid to Hitler’s intermediary, a man named Von Frey. The bank of Mendelsohn and Co., was to issue ten single checks of $1-million each, endorsed in favor of members of Hitler’s trusted staff. Hitler notified Warburg that the bankers would need to create distrust among the German people by increasing unemployment. Which they immediately did. At a hasty conference of International Bankers in New York, attended by Montagne, Norman, Rockefeller, Carter and McDean, it was agreed to send Hitler $15-million more. Warburg was once again sent to Munich to handle the details. He told the German people that they were not yet mature enough for a democracy and that a nationalist movement was what they needed. 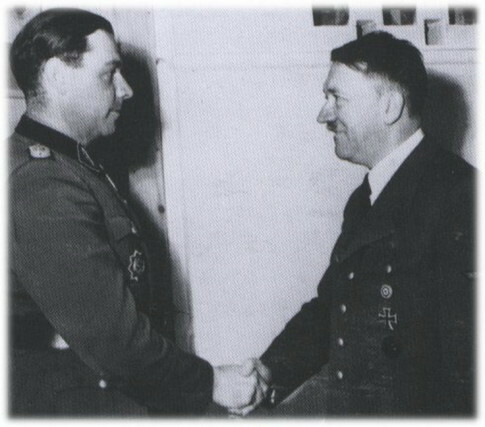 He was not at all uneasy about Hitler’s Jew baiting, since Hitler had told him that the Nazis aimed only at Galacian Jews. At this time, the International Zionists were anxious for an European War, through which they could enforce the Balfour Treaty and gain control of Palestine. The final financial arrangements for aid to Hitler came through the Jewish bank of Mendelsohn and Company in Amsterdam. 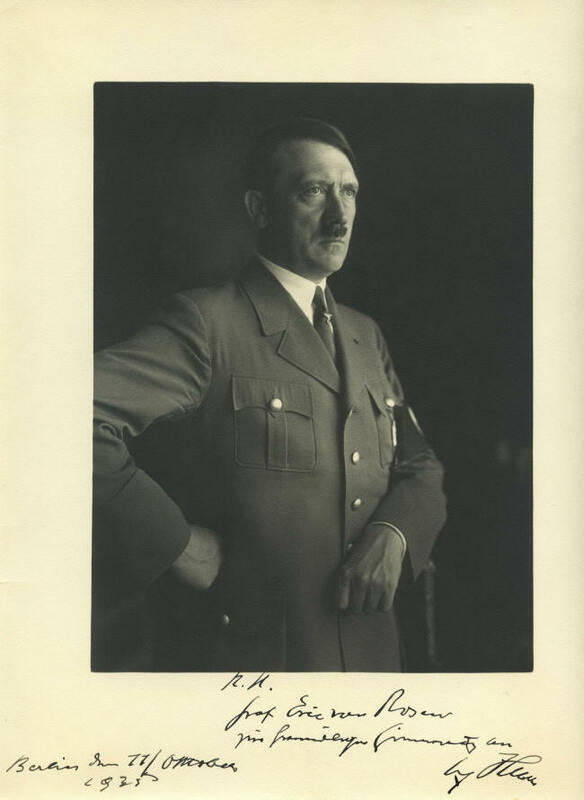 In 1933, they advanced Hitler another $7-million. When this Warburg Manuscript was published, there was an immediate drive underway to put into effect a ban of the book. This was carried out by world Jewry and the German Secret Police. Many publishers, out of fear, recalled as many copies as they could. The only mention of this book in America appeared in a short item in the NEW YORK TIMES, November 24,1933, page 14, column 2, in which Felix Warburg, of the’ New York Warburgs, charged the editor of the TIMES with perpetrating a hoax. He stated that the Sidney Warburg mentioned in the manuscript was not his son Sidney and that he was not a member of International Jewry. (Strange that they would pick one not of themselves for this sensitive mission.) It is also strange indeed, when you consider that both International Jewish and Nazis sources sought to suppress the report. The Swiss magazine DER SPERBER, published an account of this manuscript in 1936 in Zurich, which carried a detailed report of the facts contained in this outlawed book. It also circulated a book titled SPANISCHER SOMMER, which showed how the International Jews and Bankers had paved Hitler’s way in-to power. HITLER’S RISE TO POWER Hitler began his rise to power in 1919, but he had a long and stormy road ahead, until he became Chancellor of Germany in 1933. During this time, he expended a tremendous amount of money, most of it coming from non-German sources, although many wealthy German ladies, intrigued by the little mustached man, sent him their family jewels. It is also rather interesting to note that Hitler sold his idea of anti-Semitism through the help of very powerful and wealthy Jews. 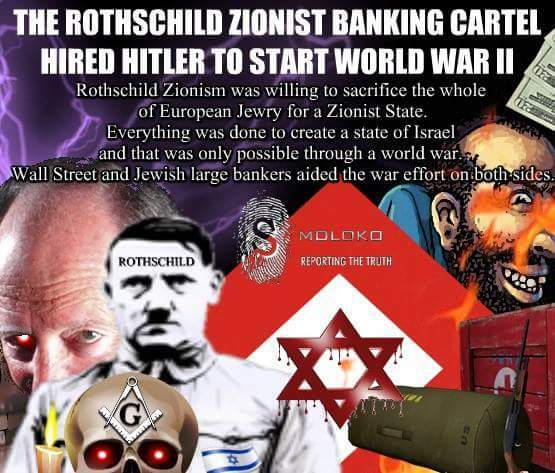 Some of these Jews used the excuse that they financed Hitler so that they could control him, but it is a known fact, that they made billions of dollars profit by financing both sides in World War II, just as they did in World War I. The Jews who financed Hitler are as much to blame for any Jewish deaths in Germany, as the German people, yet we never hear anything about this in the constant wailing over the so-called Holocaust. Most of the men who knew about these transactions between Hitler and the Zionists, met with untimely deaths. Many pages could be written on evidence surrounding their murder and how it was tied to the Inter-nationalists. One of the most prominent of these was Dolifuss, Chancellor of Austria. He was assaulted in his office by a band of Nazi thugs, who wounded him mortally and then left him to bleed to death. HITLER’S JEWISH ANCESTRY!Hitler’s grandmother, whose name was Schickelgruber, had been seduced by a Jew named Frankenberger, in whose home she worked as a maid in (Vienna. This was general public knowledge. But Dolfuss had prepared a document on this fact, which he threatened to make public along with the Dutch manuscript showing Jewish aid. For this he had to go. Today a copy of the Dutch manuscript, along with the genealogical chart of Hitler’s ancestry, is in possession of the British Secret Service, but is hidden from view by Jewish power exerted over the British Government. If it is true that Hitler was of Jewish blood and that Frankenberger was his grandfather, this may account in part for Hitler’s rise to power over Germany, which resulted in the killing of more than 9-million white Christians. If Hitler was an anti-Communist as some of you claim, why did he allow the top Communist propagandist to attend the Reichstag Fire Trail in 1933, where he was allowed to harangue the German people in favor of Communism. Why was this man allowed a safe return to Russia? This was the man that some people revere today and almost worship. A mart who was a failure in life and brought death to his people. TREASON AGAINST GERMANY!From 1933 to 1938 Hitler turned from being a creature of the generals and International Jews, into a radical totalitarian dictator. Many of those who were close to him were dismayed by what they saw. These were “dyed in the wool” German patriots who loved their country with a passionate love. They were true Germans who felt it necessary to stop the madman which was destroying the country they loved. Nearly every one of them that broke with Hitler met a terrible death. Admiral Canaris was slowly strangled to death; General Rommel, the Desert Fox of North Africa was forced to commit suicide; Field Marshall Von Sitzleden was killed and his body was exhibited hanging from a meat hook. It was no coincidence that Hitler used these sadistic means, since they were the same means used by Communism and came straight from a Judaist Talmudic background. 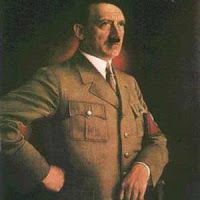 There were at least seven assassination plots against Hitler by top ranking officers in the German army in 1943 alone. 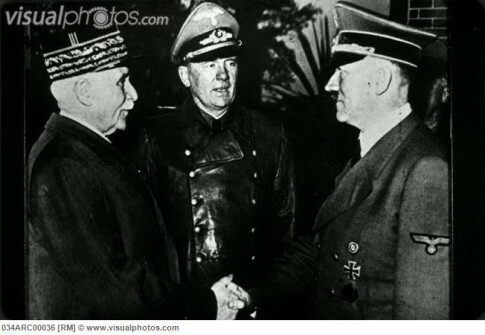 These men realized that Hitler was a “Judas goat” who was leading them to destruction. The facts surrounding these plots have been revealed by British historians after a careful study of captured documents. 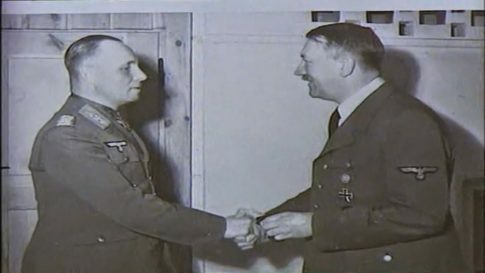 While some say that Hitler’s escapes were acts of God, I personally believe as Goff did, that he was a Satanist and under the protection of that evil one. The Bible tells us, “by their fruit shall ye know them,” and Hitler’s fruit certainly was not the “fruit of the Spirit,” spoken of in Galatians 5:22, 23. From the moment of his rise to power, Hitler used every means at his disposal to drive Germany into war. As his forces conquered country after country, it was Hitler’s direct orders which caused such a hatred of Germany among the conquered people. But Germany must die! This was the word from the “puppet masters” who even then pulled the strings which governed this strange man. It was Hitler’s stupidity that gave the Soviets 70,000 square miles of Polish territory without a fight. By 1940, with German help, the little countries of Lithuania, Latvia and Estonia were safely in the Soviet fold. Then Rumania, Northern Bukovania, and portions of Bessarabia fell to the communists. When the German armies moved into Poland it gave the Communists the opportunity to do the same from the east and allowed the Soviets to wipe out the cream of the Polish Army Officers Corps at Katyn Forest. This atrocity was used by the communists to further hatred against Germany, who in this case was not guilty. It might be interesting to note here, that while both Germany and Russia invaded Poland, England and France only found Germany guilty. Then on May 24, 1940 the German Army was in a position to defeat the British at Dunkirk and very possibly end the war. It was then that Hitler gave his famous order that the left wing of the German assault be halted. Gen. Heinz Guderin in his book THE PANZER LEADER, said that when this command came, the German military leaders were utterly speechless. It went against everything the military stood for. Yet they obeyed and the British were able to make it back to their island fortress. Here we see Hitler, with one command, destroy everything the German Army had accomplished by their blood, sweat and tears. Dr. Walter Dornberg, German expert on the development of the flying bombs and the brains behind the V-1 and V-2, stated that Hitler could have won the war in early 1944, but he held back on development of this new and terrifying means of waging war. Then to make things even worse, with Britain in his grasp, he turned away and attacked his ally, Russia. Many military experts have tried to figure out the thinking of this devious man. Had he become so drunk with power that he decided lie could conquer the world? Or was their a deeper purpose behind it? He was never on the battlefront, so did not. have to face the hardships of his people. While they were suffering and dying, he was living in sybarite splendor in Berlin. It was at this time that the British Government, followed by the United States, came to the aid of the Communist forces. They were able to draw the elite of the German forces into a conflict in which their supply lines were hundreds of miles long. It also allowed Stalin to know who was the hidden enemy in his country and hundreds and thousands of those who fought with the Germans were later liquidated. With the defeat of the Germans in Russia, the Communists were able to tighten their control over all of central Europe. Then on April 24, 1945, American forces under General George Patton were lined up along the Elbe River, in some places less than 14 miles from Berlin, when the order came through General of the Armies, Dwight Eisenhower that they were to withdraw and await the appearance of the Russian forces in Berlin. Then came the end on April 30, 1945, the London Daily Times ran a headline which said: HITLER ON BRINK OF DEATH WITH CEREBRAL HEMORRHAGE! The following day, General Kukhov and the Russian Army entered Berlin. On the afternoon of May 1, 1945, the Hamburg radio suddenly stopped its program to announce that the Fuhrer had died “fighting to his last breath against the enemy.” Admiral Doenitz, was put in command of the German forces. The great German specialist, Dr. Giensing who had examined Hitler on many occasions said that it was impossible that Hitler had died from a cerebral hemorrhage or from cancer as reported. 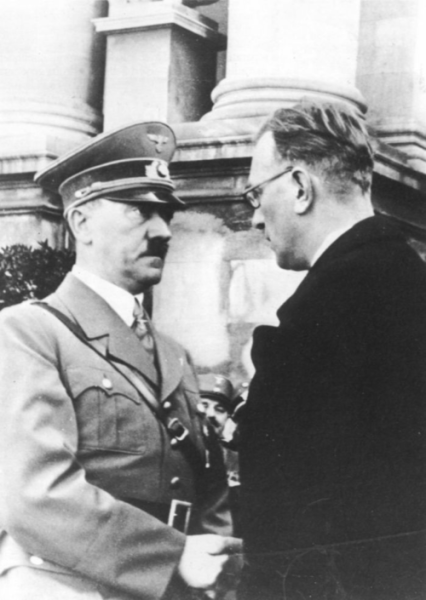 Then on May 8, seven days after the Russians had entered Berlin, it was stated that the charred remains of Hitler and three of his companions, including his paramour Eva Braun, had been found in the burned out rubble of the Chancellor’s bunker. No pictures were ever taken of his body. No concrete evidence was ever given that the body was his. There are many contradictory stories about what happened in that bunker. Whet her he escaped or not, is not the important thing. His task had been accomplished. Germany lay in ruins; 3-million of Germany’s best young men were dead; over 550,000 civilians had died and 2.6-million German homes were in ruins. Germany was set back a quarter of a century and the country was divided. Not only that, but the people of West Germany have been in slavery to International Judaism ever since and have paid over $35-billion in war reparations to those who were supposed to have escaped the Nazi Concentration camps. Then the twilight of civilization descended on Europe and over a billion people and ½ of the world’s surface came under the savage control of the anti-Christs of Communism. 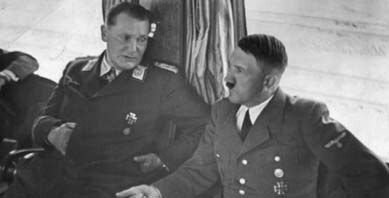 WAS HITLER ONE WORTHY OF HONOR?In the book HITLER SPEAKS, we find Hitler making this speech to Hermann Goering: “Religions are all alike, no matter what they call themselves. They have no future – certainly none in Germany. Fascism if it likes may come to terms with the Church, and so shall we. Why not? They will not prevent me from tearing up Christianity root and branch and annihilating it from Germany . . . A German church, a German Christianity is a distortion. One is either German or Christian. You cannot be both. You can throw the epileptic Paul out of Christianity, as others have done before us. You car] make Christ into a noble human being and deny His divinity and His role as Savior. People have been doing it for centuries. We need free men who feel and know that God is in themselves,” “Professing themselves to be wise; they became fools,” this same Paul said in Romans 1:22. So today, we see tile adherents of Hitler and others in these United States, as they seek to tear down the value of our Christian civilization and replace it with the heathen cult of Hitler worship, Odinism, or CREATIVE CHRISTIANITY. They have completely forgot-ten the One who said: ”I am come that they (His people) might have life, arid have it more abundantly.” (John 10:10). In Ben Klassens RACIAL LOYALTY, July 1985, page 5, he writes: “What saved them (the Jews) was the zeal and dedication of Saul of Tarsus (the Christians Apostle Paul) in spreading the poisonous new creed of Christianity among the Gentiles, a creed originating among a small Jewish sect and riot attracting any particular attention, especially among the mainstream of the Jews. In fact, Saul recognized its suicidal nature, at first persecuting this sect, since he did not want the Jews to become infected with it. Then he got the idea of feeding it to the Romans his was the most fatal and significant turning point in the history of the White Race. There in essence you have the evaluation of these modern Nazi “freethinkers” regarding Christianity. Now you do not have to be especially brilliant to see through this “literary garbage.” Rome was destroyed from within, not by the tenets of Christianity, but by Jewish ideals and Jewish economic practices, which have destroyed many another civilization. The idea of “inter-marriage”; the sympathy towards homosexuality; all signs of the decay which is brought about when men and women get away from God and try and go it with a human god. To follow this religion and these false prophets, is to see freedom die. Who is our worst enemy? A man like Klassen, or one like Hitler? and are they any less dangerous than our natural enemy, the International Jew? The best explanation of what is happening comes from a NORTHPOINT bulletin, written by Nord Davis on May 13, 1985. He says: “There is a serious hidden agenda in the formation of the American Nazi Movement. Their leaders know what they are doing and they are doing it with precision. So effective are they with so few people, one might wonder if there were no neo-Nazi groups around, the Jewish Anti-Defamation League would have to create them. Without a discredited enemy to point to, the ADL would have no cause to exist. Revolutionary totalitarian socialists (no matter what they are called) have a tactical program which is carried throughout all their propaganda, from the writing of Karl Marx and those of the socialist Hitler in MEIN KAMPE and that thread is this: Any program (Thesis) must go into direct conflict with the opposing program (called anti-thesis), this will force or produce the desired political or social changes called (synthesis). No desired change can come about without this direct confrontation. If there is no immediate anti-thesis available, one must be created, financed and agents recruited into it.” Informed Christian Patriots must not allow themselves to be trapped or unwittingly recruited into such a program, since many of them are financed by un-American, un-Christian interests. There you have the problem in a nutshell. You can always judge a man or his program by the solutions he suggests. ”By their fruits shall you know them.” So ”if they look like a duck, have feathers like a duck, waddle like a duck and run around with other ducks; you ire pretty sure you are looking at a duck!” When you listen to a speaker at a patriotic meeting, evaluate him on the basis of the Word of God. Read between the lines; don’t get carried away with his rhetoric, just because he uses patriot terminology and quotes Scripture. Satan was pretty good at doing that too. We must be wise as serpents and harmless as doves, the good Book says. I believe the old adage says it pretty well: “Walk softly, but carry a big stick.” I have found from long experience in dealing with men – training young men in three wars and fighting beside them in two, that it is not always the “loud mouth” whom you can trust. Many times when the “lead begins to fly, the loud mouth is mighty hard to find.” Just because a man loves to run around in a camouflage suit, with a big gun on his hip or over his shoulder, doesn’t mean that he’s a patriot. Just because lie loves to make threatening sounds towards minority people and Jews, doesn’t mean that he’s pro-Christian and pro-American. We are in a battle to the finish against the very forces of Hell itself. We need to be prepared. But we need to go about it in a Christian way. I didn’t say, “Let them slap your face,” Jesus never said that. He did say: “When a strong man armed keepeth his palaces, his goods are at peace.” THINK ABOUT THIS. If I have made you mad, maybe it’s a good thing. You wouldn’t be angry unless your conscience was bothering you. Maybe you need to re-evaluate your basis thinking and see whether you are really pro-American, or have you been taken in by a heathen cult? An unbelievably coherent singularity over nearly 20 generations. You’ve probably seen that (on Oct. 3) I’ve published a lot more about elite puppet Adolf Hitler and the ‘Khazar-J.-department’. And now the same Illuminati bastards, that have staged WW1 and WW2, are orchestrating civil war (mainly in the U.S. and Europe) & WW3.